Does Your Child’s Back Pack Make the Grade? Is your child’s back pack passing the test? School is approaching and with that comes a long list of items that takes an endless amount of time to shop for. For some parents, a new back pack can be found at the top of the list. Before your child contends for the newest and coolest back pack, it is more important to consider how the back pack is made. According to the American Physical Therapy Association, if your child is carrying a back pack that is too heavy or using one strap, this could cause a postural adaptation. When a back pack is too heavy, the muscles and soft tissues of the back are forced to work harder than usual which can lead to a strain. Following the guidelines above could prevent injuries and keep your child pain-free. 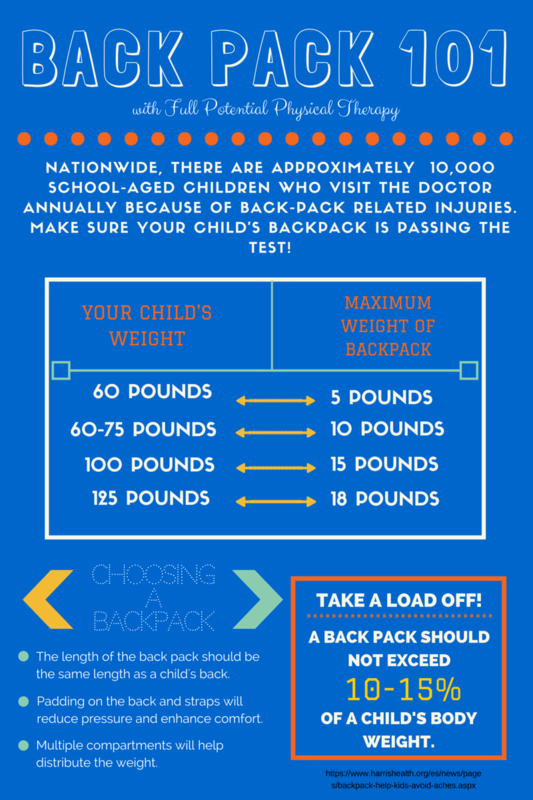 To be sure that your child is protecting their posture and growing muscles, watch for pain while carrying their back pack, tingling in their arm, and red marks when taking their back pack off. For more information on back pack safety, visit Move Forward: Back Pack Safety.